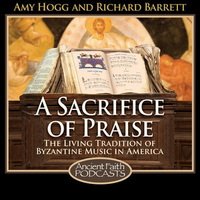 Amy Hogg and Richard Barrett continue their conversation with John Michael Boyer,the Associate Musical Director of Cappella Romana, co-founder (with Fr. Dn. John El Massih) of PRÓTO, and the Protopsaltis of the GO Metropolis of San Francisco. In the second part of our discussion John tells us about some of the exciting projects he has been working on more recently, including his textbook, his most recent recording for Christmas, and he’ll tell us the name he is using for his English language Anastasimatarion, the hymnal that contains all of the Resurrectional chants for Sundays. Find out more about The Sun of Justice CD, by the Proto Ensemble, at cappellaromana.org/product/sun-of-justice.